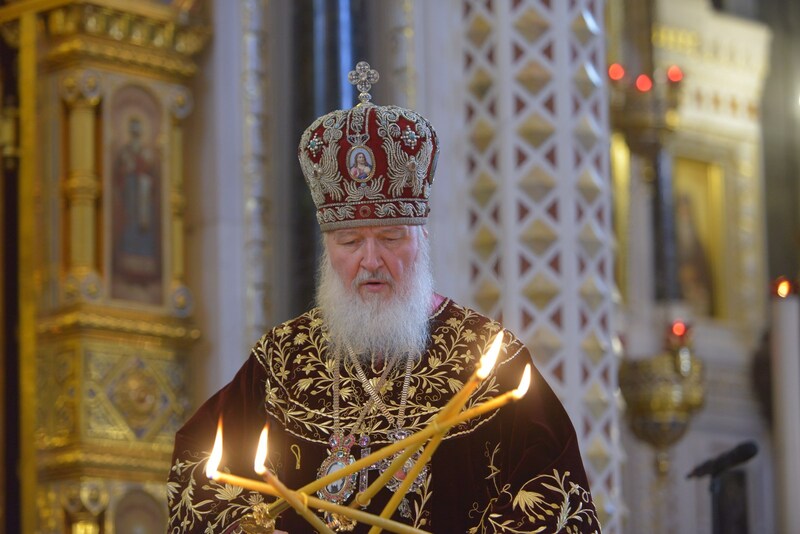 On February 1, 2014, the 5th anniversary of the enthronement of His Holiness Patriarch Kirill of Moscow and All Russia, the Divine Liturgy was celebrated at the Cathedral Church of Christ the Saviour in Moscow. Patriarch Kirill was assisted by a great assembly of hierarchy and clergy of the Russian Orthodox Church and representatives of the Orthodox Churches of Alexandria, Antioch, Serbia, Jerusalem and Bulgaria. The services was attended by high government and church officials, mother superiors of convents, Moscow and Moscow Region clergy, representatives of parish councils and professors and students of the ROC educational institutions. 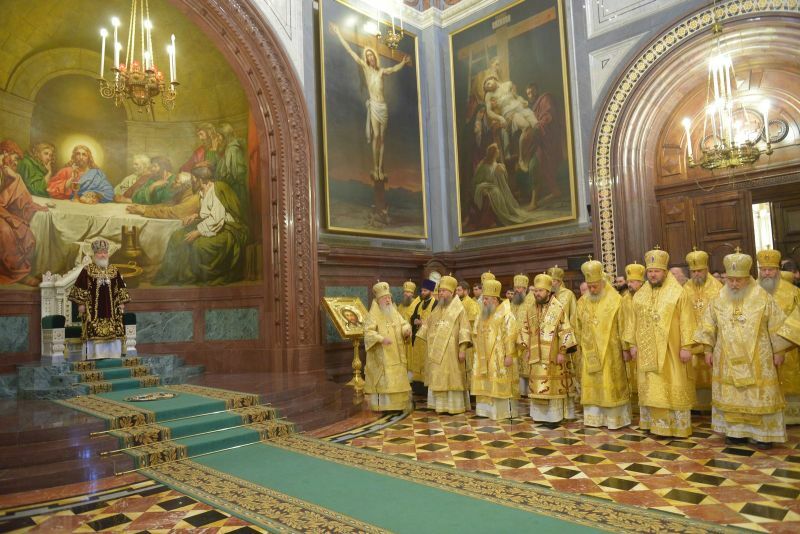 During the Lesser Entrance, the Primate of the Russian Orthodox Church elevated Archbishop Arseny of Istra, the first patriarchal vicar, to the rank of Metropolitan, in recognition of his zealous service for the Moscow diocese. The rank of metropolitan was also granted to Bishop Serafim, ruling bishop of the Metropolis of Penza. Bishops Amvrosy of Petergof, rector of St. Petersburg Theological Schools, Feofilakt of Pyatigorsk and Cherkessia, Tikhon of Yuzhno-Sakhainsk and the Kurils, Zinovy of Elista and Kalmykia and Savvaty of Ulan-Ude and Buryatia were elevated of the rank of archbishop. After the liturgy, the congregation celebrated a thanksgiving, led by Metropolitan Juvenaly of Krutitsy and Kolomna. He read out a congratulatory letter from the Holy Synod and presented His Holiness Kirill with a paramandyas with a part of the Cross of St. Sergius of Radonezh’s Cross and an Icon of Our Lady of the Passion. His Holiness also spoke about the Church’s relations with other traditional religions in Russia. “In representing the interests of the Russian Orthodox Church before the state, I never forget about the interests of our brothers and sisters who believe in God, who have friendly relations with the Russian Orthodox Church and whose ancestors lived in this land for centuries. Today they are the same citizens of Russia as the Orthodox are”. “It is my profound conviction”, His Holiness continued, “that interreligious peace and dialogue with the state are indispensible guarantees of success on the path taken by Russia as a multinational state embracing a vast geographical space. May the Lord show mercy for our Russian State for many years”. 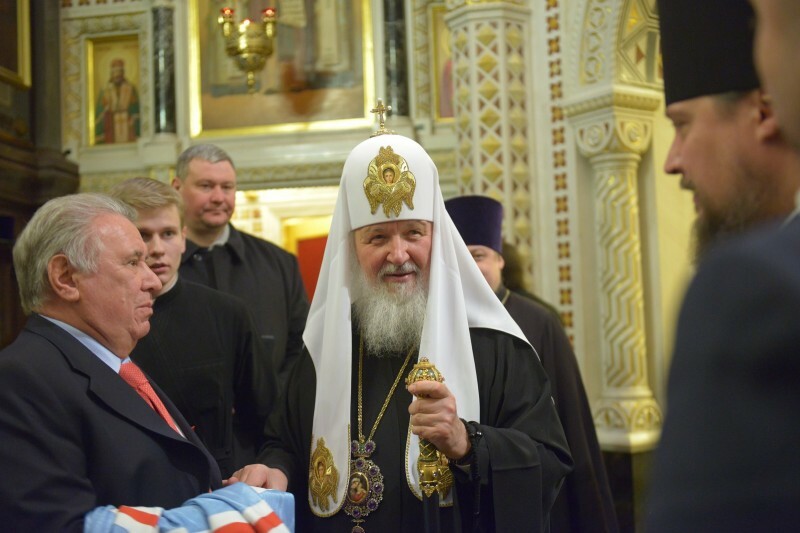 Then Patriarch Kirill presented church awards to several bishops, including Bishop Job of Kashira, administrator of the Patriarchal Parishes in Canada. In presenting awards, His Holiness said, “I have more awards to present, including to our Ukrainian bishops who could not be with us today for the well-known reasons. I will present these awards to them in good time with special gratitude to our episcopate in Ukraine for the efforts the Church is taking today seeking to reconcile the divided people, to preserve their unity, to reinforce their spirituality, so that no political circumstances could destroy the great tradition which comes from Prince Vladimir and which is realized in the efforts and work of our Church”. In conclusion of his speech, Patriarch Kirill expressed “special gratitude to representatives of public and youth organizations who were standing with posters at the church walls notwithstanding the frost, expressing support for their Patriarch. I value your passionness, your ability to defend the interests of the Church. I thank you for this support and invoke God’s blessing upon you”. According to the Interior Ministry’s report, about 4 thousand people worshipped in the church and at its walls.